The clutch of the car is designed for smooth joining of the gearbox to the engine, in other words, it allows you to associate the movement of the wheels with the engine speed. The clutch pedal reduces the friction and allows you to smoothly connect the engine flywheel to the shaft of the transmission to start moving or to carry out switching of speed. To achieve a smooth start of motion from place can only be correctly squeeze the clutch. All exercises to work with the clutch at the initial stage it is necessary to conduct strictly straight and the front wheels should be straight. Sit in your car and make sure the car is the Parking brake on and in neutral gear. Then turn the ignition key and start the engine. Left foot press the clutch pedal and depress it to the end. Put your right foot on the brake pedal to in the case of the road surface gradient is to be able to brake if the car will roll backward or forward. Turn on first gear and release the handbrake. Start to smoothly release the clutch pedal until, until the time of its operation. Note the indicators for the tachometer arrow on the display should start and the number of revolutions to increase. Lock the leg in this position and move your right foot from the brake pedal to the gas to add momentum and help the car glide. Smoothly add gas and continue to slowly release the clutch pedal with the left foot. Once the grip loosened, just a little bit of gas. To smoothly switch gears you must let go of the gas pedal and at the same time squeeze the clutch, and then you put the gear lever in neutral position. Then, after a small delay, switch the lever to the desired position. Left foot slowly release the clutch while pressing the gas pedal. 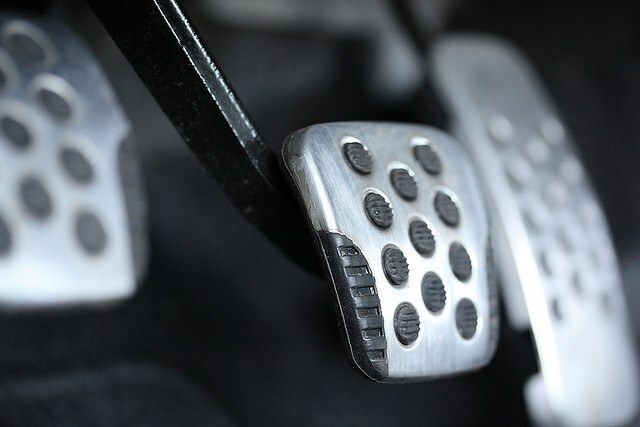 When shifting the clutch can be released in one movement to avoid jerking the car. However, the left leg needs to move without lifting off the pedal, parallel to slowly and gradually pressing on the gas pedal. If you squeeze the gas abruptly, it can cause excessive fuel consumption and a sharp roar of the car. The gas pedal should be release before or simultaneously with the gear change, but not at the time of acceleration. During operation with the clutch it is best to pay attention to the indicators for the tachometer. When quiet acceleration arrow should not go beyond 3500 rpm.